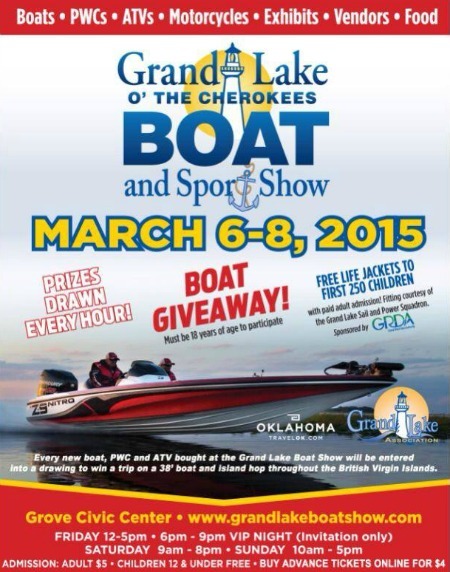 For 18 years, Grand Lake has put on a great boat show, and this year is no different with the Grand Lake O’ the Cherokees Boat and Sport Show set for March 6th through the 8th at the Grove Civic Center. The Grand Lake Boat Show is the best place to browse and then buy your dream boat, ATV, personal watercraft, motorcycle and accessories all under one roof. You will find a large selection of pontoon boats, tri-toon boats, deck boats, fishing boats, jet boats, personal watercraft, ATVs and motorcycles along with helpful and knowledgeable sales folks to help you pick out the right rig for your lake living lifestyle. Yes, there is a Boat Giveaway – Every person 18 years and older will have the opportunity to roll 7 dice for a chance to win a new Tracker boat and trailer. And, for those that actually buy a boat at the show they will be entered into a giveaway for a British Virgin Island trip on a 38′ yacht. Besides those 2 fantastic opportunities to win, there will also be a mobile app available for people to download for exclusive discounts. There will also be a kids zone and you can keep up on the scores of your favorite basketball team in the sports corner. And, of course, there will be hourly giveaways throughout the show! Once again this year GRDA will be giving away free life jackets to the first 250 children at the show, with fitting of the life jackets provided by the Grand Lake Sail and Power Squadron. On top of that, the Grand Lake Sail and Power Squadron will have a boating operations simulator for kids over 12 years old. The simulator will put players in real life boating situations and teach them how to properly navigate. You will also find over 50 vendor booths with everything from local arts and crafts to boating and dock accessories to information on fishing tournaments and the upcoming GLOC Shootout this July. Plus, Santa’s Old Broads will again be operating the kitchen with delicious concessions. There are live demonstrations as well with the Bernice Nature Center doing a touch and feel animal presentation, Brent Malone – the Director of Fishing Tournaments for the Grand Lake Association – will be speaking about Grand Lake seasonal patterns and doing a pitching tournament for prizes for both adults and kids and Sherry’s Dance Center will be performing as well. For more info you can visit the event website at http://www.grandlakeboatshow.com or visit the Grand Lake Boat Show Facebook page. Admission to the show is only $5 for adults with children 12 and under free with a paid adult ticket. You can also save a buck by buying your ticket in advance on the event website. Show hours are 12 pm – 5 pm on Friday with an invitation only VIP Night on Friday from 6 pm to 9 pm. Then the show opens back up on Saturday from 9 am to 8 pm and Sunday from 10 am to 5 pm. While there is always a lot of talk about the Tulsa Boat Show every year, it is the Grand Lake Boat Show that brings the Grand Lake community together every year. So if you are ready to learn about boating safety, boat maintenance and repair, the latest in boat and dock accessories, boat financing or insurance, inboard and outboard engines, the newest boating electronics, boat lifts, local marinas, local real estate, golf and so much more…then make plans to attend the 2015 Grand Lake Boat Show at the Grove Civic Center March 6th through the 8th.